When individuals are trying to transform their physique and/or to perform better, their mindset often turns away from food as fuel. Instead, we focus on avoiding certain macronutrients (often carbohydrates) or eating less altogether in an effort to lose weight. We fixate on “healthy” options rather than options that will optimally fuel our training. To shift our focus to food as fuel we have to embrace the fact that choosing a healthy food/meal/snack does not necessarily mean that the body will be properly fueled. Think about it like this; gasoline and water are both liquids, right? But only one will fuel your car. The human body works the same way; just because it’s healthy food does not mean it’s fuel. Let’s now examine two common options that individuals gravitate towards when they are trying to “go healthy,” or lose weight in an effort to increase performance. Keep in mind that the following macronutrient suggestions omit fat-adaptation strategies employed by some endurance athletes. The ratios below are designed to help guide athletes seeking general performance benefits and balance from their meals. 390 Calories, 9% Carbohydrate, 43% Protein, 48% Fat. Is this meal healthy? Absolutely! But once again, eating healthy is not the key to success. In this example, there are just not enough carbohydrates to fuel the body. In other words, this is food, but not fuel. To hit the ideal ratios for health and proper fueling, we want approximately 50% Carbohydrate, 25% Protein, and 25% Fat. So here we go… reduce the salmon to 3oz and add a cup of cooked brown rice. How does this meal break down now? 431 Calories, 50% Carbohydrate, 25% Protein, 25% Fat. Wow, what a difference from the ‘healthy’ choice above! Now this meal will both fuel and feed the body. Nuts are a high-fat food. Because fat from nuts is unsaturated it’s often considered “healthy” but it’s still fat, and a ton of it. 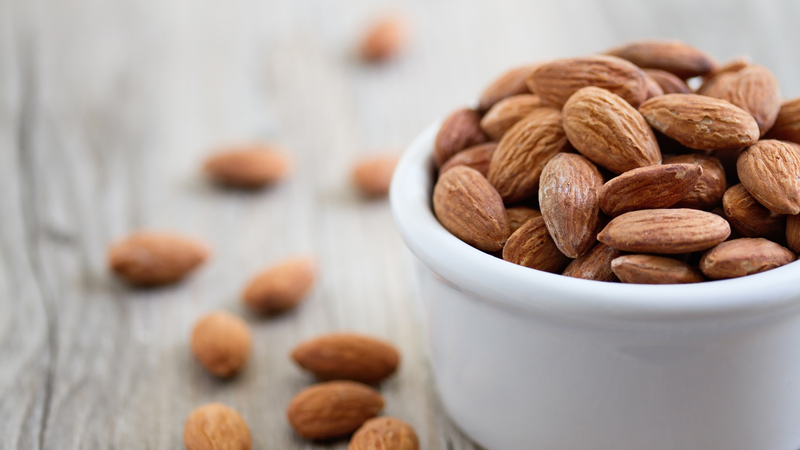 Just ½ cup almonds will net you 680 calories, 71% fat! And we wonder why our latest and greatest high-fat diet has become a complete train wreck! 1.5 TBSP almonds, 3/4c Plain Greek Yogurt, 1c Blueberries, and 1 Banana gives you 406 Calories, 53% Carbohydrate, 22% Protein, 25% Fat. You don’t have to avoid those nuts altogether, but balancing them with other macronutrients will create a more satisfying and fuelling meal. You’ve probably heard of serotonin, a neurotransmitter responsible for feelings of wellbeing and satisfaction. An essential precursor to the synthesis of serotonin is tryptophan, an amino acid found in many protein-rich foods like meat, dairy and poultry—as well as some leafy greens and grains like oatmeal. Ironically, both serotonin and tryptophan levels in the brain will decrease with the intake of protein-rich foods, unless they are supplemented with carbohydrates. In other words, high-protein/fat diets that limit carbohydrate will reduce the satiety benefits of serotonin, and you’ll likely need to eat more to feel satisfied. By skimping on carbs, not only are you depriving yourself of critical fuel, but you could be upsetting the natural balance of the neurotransmitters that control your appetite. Before every meal/snack, I encourage you to ask one question “is your food fueling you?” While they share common ground, eating for health isn’t the same as eating for performance. If you’re ever at a loss, simply remember to shoot for approximately 50% Carbohydrate, 25% Protein, and 25% Fat for optimal fuelling.